We’re still in the post-shadow of both the Mars and Mercury retrogrades, and still experiencing the aftershocks of the recent eclipse season, but we are ALMOST THERE. ALMOST OUT OF THE WOODS. Can I hear an Amen? As we climb out of this energetically volatile time, it’s safe to go ahead with our plans – but wisely, and no rushing. Let’s take it easy this week so as to secure our footing while we enter the next cycle of learning, change and growth. You’ll see what I mean when we get into this week’s reading. Here we go! Notice all three Tarot cards are reversed this week – there’s a reason for this. Reversals in the Tarot can mean a lot of things, but essentially they behave in a similar way to retrogrades in astrology. We’re talking delays, setbacks, unexpected changes, etc. 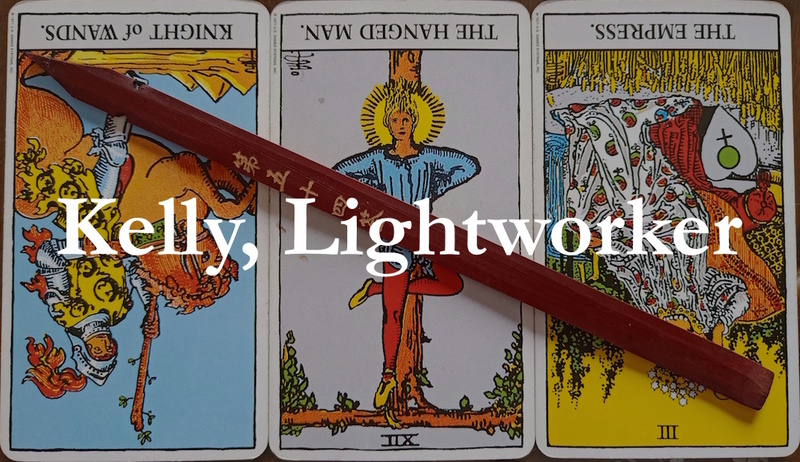 RIGHT: KNIGHT OF WANDS REVERSED. This Knight is associated with arrivals and (more likely) departures. When this card appears, someone or something is meant to move on but there’s some kind of obstacle holding back this movement. But have no fear, chickadees – my sense is that this blockage is only temporary. How long depends on each individual situation, but what’s important is that we understand this is a transient stage in events. Look at the big picture. Don’t be fazed by the minor (and confusingly ambiguous) fluctuations of day-to-day developments. You’ll drive yourself crazy if you do. Take a step back, breathe, and observe the general trend. Trust that the Universe moves in waves and cycles – also, She never contradicts Herself! MIDDLE: THE HANGED MAN REVERSED. Some things may or may not be within your control, and that’s totally okay. This card in reversed, combined with the ill-dignified Knight of Wands, indicates that several of you will be playing a waiting game of sorts this week. Don’t fall into the traps of impatience and self-pity; it’s not worth the angst. Focus on what you can do about the situation – or, if it’s better for your sanity and peace of mind, focus on something else entirely – and work with what’s within your means to handle. It’s okay to distract yourself while waiting for a situation to unfold. THere’s an old saying: A watched pot never boils. Obsessing over the situation will not make it develop faster, or more favourably. RIGHT: THE EMPRESS REVERSED. While you’re at it, now is a good time to focus on what else needs tending and nurturing. Perhaps you’ve neglected other parts of your life (or other important people in your life, including yourself) while fixating on this issue before you. Get back to the basics of self-love, self-care, and self-acceptance. Then look around you and reach out to the people in your family, tribe or squad who need some love too. Trust that no waiting game lasts forever. In fact, waiting games don’t even have to exist if we choose to channel our energies into that which is productive and fulfilling. Look around you, darlings. The Universe is kind. All is full of love. Choose love and kindness, always. Treasures obtained in dreams are nothing once you wake. Don’t presume: things are not what they seem. What is destined requires no assistance to manifest. This divination lot advises an objective view of the situation you’re in, and warns against being swayed by internal delusions and external illusions. If you’re wrestling with something that’s currently driving you crazy, step back and breathe. Do not rush your decisions at this time. What’s important is to seek the highest and greatest good in the challenge you’re facing, and to understand that what is meant to happen will happen once conditions ripen sufficiently. You need only to be patient. This is good news if you’ve been maintaining positive karma and doing the right thing. If you haven’t been, for the love of Goddess – please start now. And remember: choose love and kindness, always.